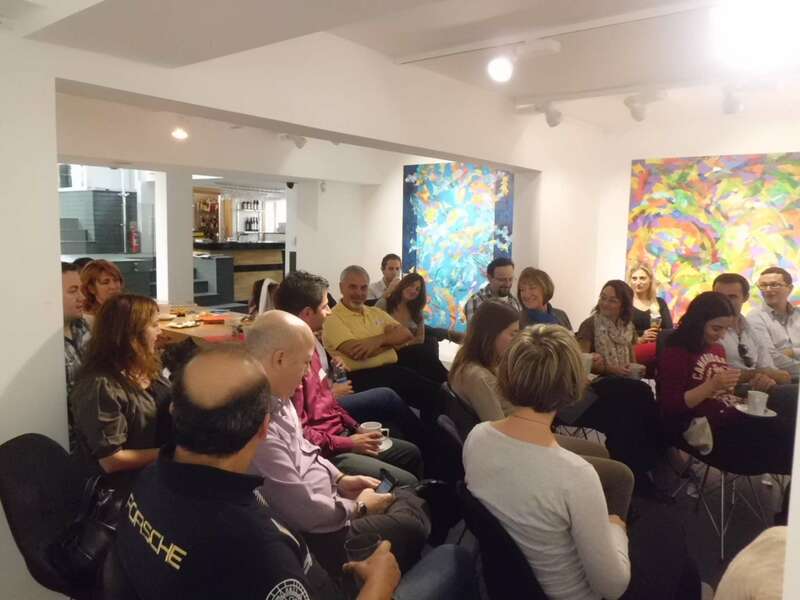 On November 4,2012 we held our 2nd meeting at the Gallery Art350. We absolutely had another fantastic meeting. 31 members participated and I would like to thank all those who chose to spend a complete Sunday afternoon together. We started our meeting, by introducing ourselves to the group. We were a very good combination of people from different countries, different professions, different ages but we were all open minded, smiling “Curious Souls” :-). Neil Harbison was born completely color blind and he can see the world only in grayscale. Nevertheless, with a new device attached to his head, he can now “listen” to colors. This device turns colors into audible sounds and, as Harbisson explains, the world now is a “symphony of colors” for him. He says that even going to a supermarket is very much like “going to a disco” 🙂 The talk was simply wonderful. We learned about something that we didn’t imagine was possible. During our discussion on this talk, we even asked ourselves how our world would be if we were to extend our capabilities of detecting more senses and demanded more to experience. Would the world be a more interesting place or a more confusing one? The second talk we watched was that of the Nigerian novelist Chimamanda Adichie’s. Her talk is titled “The Danger of a Single Story” and in her talk she explains how we all have a tendency to create “single stories” about countries and persons. In her powerful talk, she tells us how she discovered her authentic cultural voice voice in her writings and gives humourous examples of “single stories” she encountered as a young Nigerian student in US. She says, “when we reject the “single story”, when we realise that there is never a “single story” about any place, we regain a kind of paradise !” I really liked this message. Not only was this talk powerful and interesting, but so was our discussion on this talk. My friend Karen Van Drie moderated our discussion and I thank her for her subtle, interesting and thought provoking questions. During the discussion on this topic, we talked about the “single stories” -i.e. the stereotype images and prejudices we face, we talked about the single stories we create ourselves, and many other things. It was also very interesting to learn about how Karen had a “no story” instead of “single story” on Turkey before she came here and how she was positively surprised. We stressed that having an open mind and an ability to reach information was important. Our discussion was simply inspirational. I am sure, from now on, we will be aware much easily, whenever we start creating “single stories” in our minds and thus we will have a better chance reject them. We then watched the talk of Alain de Botton that is titled: “A kinder, gentler philosophy of success“. Alain de Botton, in a very eloquent and witty way, expains how success is viewed as extremely important in our comtemporary societies and how we can have prejudices about a person basing on his business card. He explains that career anxiety increases when a society becomes more “meritocratic. He points out that in a meritocratic society, it is believed that a person who has the ability, talent and energy can indeed always become successful. Likewise, failure is also veiwed as a deserved outcome. Nevertheless, Botton points out that in life there are too many random and uncontrollable events, that, it is sometimes simply impossible to get what you want. So, he says, that we need to develop a gentler philosophy of success and take this into consideration while we try to see the real value of a person. Botton also draws our attention that we are highly open to suggestions in our ideas of success. He says that we need to consider whether our ideas of success really belong to us or not. He adds that, it may be bad not to get what you want but it would be worse to find out that it wasn’t what you wanted all along. 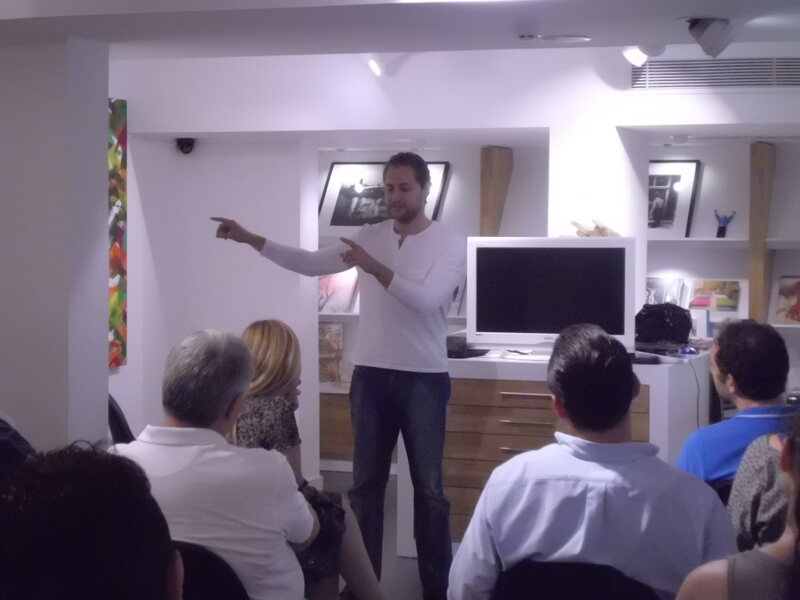 My friend Alper Rozanes moderated our discussion on this talk and I would like to thank him for taking up this task at the last moment. With his witty and outgoing style, we considered how we viewed success and happiness, how we tended to be perfectionists, how society could be misguided by the stereotype images, how difficult it was sometimes to see the real value of a person beyond his success and what could be done about these. Our discussion was very interesting. Louie Schwartzberg is an award-winning photographer and a cinematographer who initially started shooting time-lapse photography of flowers and then he started making films. During his talk, Schwartzberg shows a short video that he prepared on nature, on people and on having gratitude for being able to experience all this beauty. When I watched this video for the first time, I thought that it had absolutely the most beautiful images. It felt like it was dance of colors – not a symphony of colors like Neil Harbisson but a dance of colors for me :-). So I decided to include this talk at our meeting. It was very relaxing and meditative. With that soothing video, we came to a close of our meeting. We expressed the hope to see each other in approximately a months time. At the end, I requested everybody to contribute as much as they can in the selection of talks and finding new meeting venues. I would also love to receive your positive and negative criticisms about our meetings so that I can understand what you like more and how I can organise our meetings better. I thank you all and wish you very nice days.